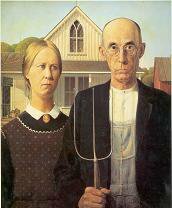 Grant Wood's iconic painting "American Gothic" travels to our area and will be on view at the Renwick Gallery of the Smithsonian American Art Museum from March 10 through June 11, 2006. This exhibition marks the first time that the painting (owned by The Art Institute of Chicago) has traveled to Washington, D.C. in more than 40 years. The WaPo's eloquent Chief Art Critic depressess us all with his insightful and run-for-the-Xanax review of the Whitney Biennial, and JT Kirkland picks up on the mood and asks some good questions about the meaning of it all. Gopnik here and Kirkland here. My message to all of this depressive, cynical art and all the associated whiners? If you think life is tough, then think about all the twentysomethings in West Virginia whose only jobs may be pulling the guts out of turkeys, or worse still, the kids in the P.I. who scour garbage dumps looking for something to eat, and if lucky may find some discarded turkey guts to eat. DCist's Adrian Parsons reviews the WPA/C's Wallsnatchers in Georgetown. Artists and art dealers should always remember this rule (especially in a small town such as the Greater DC area is): You reap what you sow. Recently a well-known DC area curator emailed me to let me know that she had referred to me a collector who was looking for figurative drawings. The usual referral commission in the business of art is 25%, so I emailed her back and asked to verify that percentage and she did. The collector then came to my studio and bought a couple of drawings, and I immediately sent the curator a check for her commission. She then emailed me back a few days later and thanked me for my promptness. Conversely, a while back a couple of different curators approached me asking for help in finding some artists for a specific acquisition project. I spent some time with each one of them, and then gave them a list of artists, as well as the artists' contact information. I then contacted those artists and/or their gallery dealer, and told them that I was referring curator so-and-so to them in order for the curator to view and possibly purchase work from them. There were about 15-20 artists that I referred and who were then contacted by the curators of these two separate projects. Some of the artists are represented by us, and thus they know (because our contract is very clear on that issue) what a referral commission is. Several of the other artists (whom are not represented by us, or in some cases by any other gallery) emailed me to thank me for the referral, and subsequently even a few of them emailed me to let me know that the curators had purchased artwork. Some never even emailed or contacted me to thank me for the referral, but most did. So far only one of those artists has asked what our referral commission is, and I am sure that if/when a sale is made, that the gallery will get a check for that commission from that one artist. Let's see what happens with the rest of them... you reap what you sow. ANABA highlights some of the damaging information being revealed by comments at Edna V. Harris' blog that appear to indicate a serious degree of conflict of interests and nepotism in the selection of some artists for the Whitney Biennial. It shouldn't be a surprise to anyone. Any curated exhibition, including the ones that I've done, are always marred by some degree of nepotism, although there is generally not so much obvious and amazing conflicts of interests as this Biennial has apparently revealed. But I am surprised that neither of the two distinguished and verbose Senators from New York haven't (yet) called for Senate hearings on this issue; can you imagine the amount of TV face time they'd get? Fallon and Rosof have a really good walk-through of the Biennial here. One of the great things of living around here is that we're surrounded by places that have their own local flavor of art. And nearby Frederick hosts a gallery walk on the first Saturday of every month. You can enjoy exhibit openings, guest artists and live entertainment designed to showcase the best of downtown Frederick the first Saturday of every month from 5-9 pm. You'll also enjoy extended shopping hours at many of their specialty stores. Details here. There's a particularly interesting dual exhibit opening at The Artists' Gallery. "Told in High Color," features the art of Amy Connor and "Garden Variety," photography by Palma Allen. Amy Connor is one of Frederick’s newest emerging artists. Originally raised in the mountains of Virginia, she moved south to study Fine Art at the University of Florida. As her career developed she was represented by several galleries located in the Gainesville and Palm Beach area. She has recently returned to the area, and now where she is the newest member of The Artist's Gallery. In "Garden Variety," Palma Allen continues evolution of an idea with respect to the subject matter and her new works includes experimentation with digital negatives contact printed onto cyanotype treated cloth and paper.